Here’s an easy way to keep track of your rubber stamp collection, using a note book and numbering system. Finding the perfect rubber stamp, just when you need it, isn’t always the easiest thing to do. Here’s my solution for finding the perfect stamp in your collection every time. You can sort your stamps according to category, etc, before stamping them in your book, but as long as your collection is not too large, you shouldn’t have much trouble in flipping through the pages to find the stamp you are looking for. Simply stamp an impression of every rubber stamp you have in a notebook. 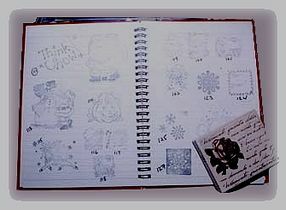 Using a marker, mark the side of the stamp and the impression in your notebook with the same number. Storing your stamps with the number visible will make finding the numbered stamp easy and a quick look through your notebook will tell you what number that particular stamp is marked with. Keep plenty of baby wipes close by to rest your stamps on while you stamp all of them into your notebook – this will make the clean up of all your stamps much easier when you are all done.